Maine is home to over 5,000 rivers and streams that were carved out by glaciers during the last Ice Age, making it a great destination for fly fishing. While you can fly fish throughout the state of Maine, it’s really the Western and Northern regions of the state that shine. If you’re not sure where the best fishing holes are since so many of the best ones are kept as secrets by the locals, there are plenty of Maine guides that will show you at least a few of them. The Roach River starts at First Roach Pond in Kokadjo and flows over six miles into Spencer Bay on Moosehead Lake in North Central Maine. 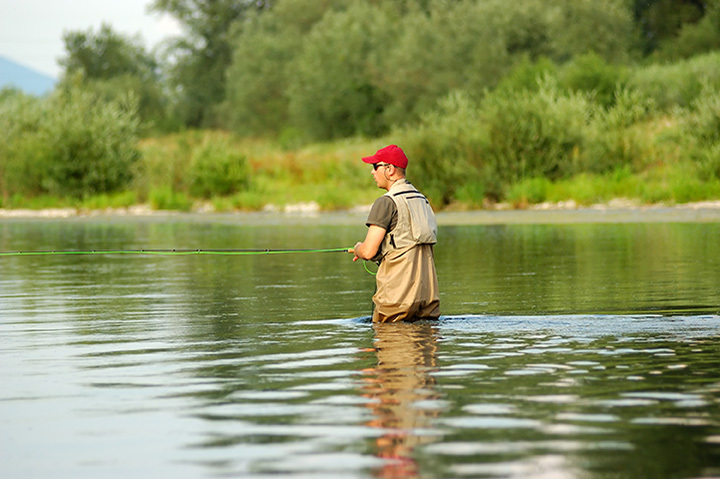 The Roach River is restricted by the state as fly-fishing only and it catch and release. If you just enjoy the thrill of the sport then fly fishing at the Roach River doesn’t disappoint. The river is about 50 feet at its widest and has plenty of good pools and riffles to catch an array of fall salmon, trout, and brook trout. The Androscoggin River is one of Maine’s largest river ways extending from Gilead, New Hampshire all the way down to the Atlantic Ocean in Brunswick. Due to years of pollution, fishing below the Auburn town line is not recommended. The best section for fly fishing is the 30-mile stretch between New Hampshire and Rumford, especially around the Bethel and Newry area. You’ll find plenty of rainbow and brown trout stocked in the river. While the river is stocked, you can still catch “wild” fish in the 18 inch to 20 inch range. The river is one of the best for fly fishing because it’s really to access by foot or vehicle and can be waded in most parts. The Kennebec River runs from Moosehead Lake in North-Central Maine all the way through Skowhegan, Augusta, and ultimately down to the Atlantic Ocean in Bath. The Kennebec River is ranked as one of the best trout rivers in Maine. Brook trout is common in its upper sections between Augusta and Moosehead Lake while the downstream sections are mostly populated by Brown and Rainbow Trout. The river can be fished in many spots, but one of the best spots for rainbow and brown trout is about three miles below the Shawmut Dam in Fairfield. The best wading water can be found right below the dam. Need some new flies? Check out the Fly Fishing Only Shop on Main Street in Fairfield for all the supplies you need and where to fish. Originating from Northwestern Maine, the Penobscot River is a 109-mile river running past the city of Bangor and emptying into the Atlantic Ocean in Penobscot Bay. Some of the best fly fishing can be found in the 11-mile sections between Ripogenus Dam and Abol Bridge at the border of Baxter State Park. The stretch of water has fast rapids, deep pools, and lots of Brook Trout and wild, Landlocked Salmon. Since the river is fast in this section, it’s recommended to fish from a driftboat or inflatable raft. The Rapid River is one of Maine’s most famous fly fishing rivers since the early 1900s. Part of the Androscoggin River basin, the Rapid River flows from Richardson Lake in the Rangeley Lakes region down to Lake Umbagog in New Hampshire. The Rapid River is unique in that is has a pond in the middle of the river and is outstanding for its native Brook Trout and Landlocked Salmon populations. The river is restricted to fly fishing only and has a catch-and-release regulation on all trout and a three-fish limit on salmon. It’s great fishing all summer long. View more Maine Fishing Holes.